These 25 Beautiful Bridal Hair Accessories represent the best of the best when it comes to adding some unique glam to your wedding day hairdo. These bridal hair pieces will really bring your whole look together and you will look absolutely beautiful on your big day. Many people think about wearing special jewelry when they get married, but you can also add some memorable finishing touches by accessorizing your hair. These wedding hair accessories will really steal the show and look breathtaking in photographs. When it comes to hair accessories for weddings, these hair clips, hair combs, and flower crowns really take the cake. 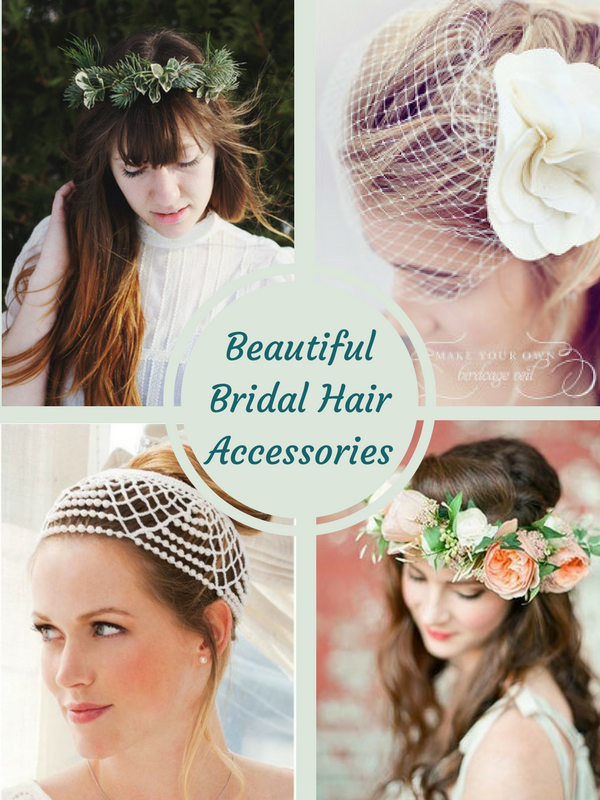 Whether you are going for a vintage/bohemian feel or you want to acheive a more classic and traditional look, there are tons of great bridal hair accessories to choose from. Plus, many of these looks you can recreate on your own, so you don't need to worry about breaking the budget when it comes to your bridal outfit. If you want a flower crown or a beautiful birdcage veil, take a look at these wonderful ideas and prepare to be dazzled by creativity and beauty. DIY flower crowns are one of the most popular bridal hair accessories these days. It seems like everywhere you look, you see a bohemian bride sporting a beautiful crown of flowers around the top of her head. This look has an effortless feel and looks so sweet with a flowy, delicate gown. For even more DIY bridal hair accessories, check out our collection of 29 DIY Hat Accessories for Elegant Bridal Hairstyles. For the more traditional bride interested in acheiving a classic look, a wedding hair clip will do just the trick. Worn on the side of the head, these DIY bridal hair accessories look so chic paired with a birdcage veil. You can also add an element of sparkle by pairing your hair clip with a dramatic, long veil. Either way, you can't go wrong with these pieces of jewelry for your head. Find all the wedding inspiration you need by checking out our FREE eBook. The Ultimate Wedding Guide: Wedding Planning Timeline, Wedding Etiquette and Advice, Maid of Honor Duties, and More has everything you need and then some! Bridal headbands are incredibly popular and a great alternative if you don't want to go the full flower crown route. A dazzling beaded headband can really add a pop of sparkle to your outfit, as well as showcase a beautiful updo or veil. Headbands are a great DIY wedding project. Before you know it, you will have a beautiful hair piece you can wear long after your big day has passed. Love all these, and so glad there's a good bird cage tutorial!